Following on the twenty year theme, my husband and I are unusual in that we have both been in the same professions for our entire working lives. He joined a major bank as part of the graduate scheme, and despite throwing all my resources away a couple of times, I’m still teaching. Once upon a time, our salaries were even comparable. I find it fascinating that our very different professional worlds (he gets bonuses and paid social events) are using more and more of the same language and thinking. He recently went on a Growth Mindset workshop, and we’ve had long discussions about the roles of mentors and professional learning. We are both interested in leadership, and this article in the weekend’s New Zealand Herald provoked some discussion. Never mind leadership, get on with your job. The article suggests that sending staff on leadership training is a waste of time, as there will only ever be a limited number of leadership positions. It is more worthwhile to encourage good “followship” habits: following instructions, seeing tasks through, and alerting leadership to flaws in processes or tasks. The researcher quoted also said that more industry recognition should go to followers than leaders. One of the special characteristics of schools is the range of groups we are involved with. I am in two small curriculum groups, within one larger faculty, a PLG, a committee, a working group, a mentoring group, and a whole staff group. And that’s just what I could think of at the moment, not including the wider community. All of these groups have different leaders, and my role in each is different, from unchallenging follower, to active participant, to expert, to transformational leader (I hope!). A common complaint in teaching is that leadership positions take you away from what you’re actually good at – teaching students. The recognition of alternative career pathways, particularly through the IES, could change this practice. I find that term belittling, but as it fits in with the article, I’ll use it. I admire the skills of people who can see a process through, sort out the details, who you can rely on to just get on and do it. I think any big-picture thinker would agree. 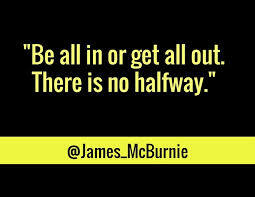 A team needs all sorts of skills, thinking habits and work habits to get on, never mind to grow, develop and innovate. Education has so many teams, pathways, and directions available that I believe there is still potential for many, many leaders. I agree that there are good leaders and bad leaders, and that leadership training is not yet available for all when it is needed. I also agree that teams need all sorts of skills. While I believe that some of the followship traits of discipline and attention to detail are key skills for our students, I would also argue that leaders need these traits too. Can you imagine working in a team where the leader had none of these? Less hierarchical structures, and a mindset that encourages multiple values are the way forward. What happens when nobody checks the gravity’s turned on. My teaching journey began many, many years ago. I started in a special character boys’ boarding school. At 22. Hmmm. Reflecting on my teaching style then, it was all about photocopied resources, tentative steps into Cooperative Learning, some group work. Giving model essays was frowned upon because the students might learn them. My most troublesome class was 30+ doing School Certificate English, 9 of them doing exactly the same course for the second time (including one student who got 48% first time, 26% second time and 49% third time – Why?). On the plus side, I had fabulous colleagues, including an HOD who firmly believed in mental health days and who would ring to check on me if she noticed me looking particularly stressed. I don’t have to know everything! This is probably the biggest learning curve for me. I get such a buzz when students can teach me something, or when they can pursue their interests, or make their own connections. I’ve always tried to be creative, but that used to be adding pictures to worksheets or handwriting in different fonts on the blackboard. Now my students and I can let our imaginations and production methods loose. This year we’ve made videos and movie trailers, written scripts, told stories and held silent debates. But is it that clear-cut? When I was studying at The Mind Lab last year, I would get annoyed by the absoluteness of the traditional teaching-bad and future focused teaching-good labels. Twenty years ago, I was still getting students to work together, to take their learning into the community, to take responsibility. We wrote and produced a soap opera, planned fundraising events, created mascots, and things that I would love to do again now. In contrast, some of the collaborative work students do today lacks the depth of learning that I would expect. my colleagues and I continue to grow and embrace change. This isn’t a contradiction of the above point. We are lucky to be in such a dynamic profession where anyone can lead and motivate. Another twenty years of all in! Success at the end of the year starts from the very first day. A fascinating discussion with a colleague today about how we can stop the end of year lethargy some students exhibit. We came to the conclusion that the relationship we have with our students from Day One sets the tone. Having high expectations of all year round success is vital for all students, so that they can develop these expectations for themselves too. Towards the end of last year, I suggested one of my very quiet students ask another student for some particular help. To my shame, she whispered, “Who’s that?” Sometimes I assume that the students know each other. After all, they’ve spent five years at school together, they’re interested in each other (or not!). But no. The discussion today reminded me that a positive class environment is not just about the student-teacher relationship, but also the relationship between students. So we’re going to spend a lot of time at the beginning of the year getting to know everyone in the class. In conclusion, starting at the very beginning, is indeed a very good place to start! The ongoing discussion about how students organise their learning. Three levels of BYOD! Years 9, 10 and 11 are all showing up on Wednesday, device in hand, ready to learn. And teachers being teachers, we’re talking a lot about the little things, primarily organisation. I was quite proud of myself and my students by the end of last year with how well we had organised our Google Drive folders. There were folders and subfolders, and even colour coding. This required very specific teaching and instructions, and there was still a lot of work to do on giving files relevant, discrete names (not English Work for the tenth time!). A colleague said this at a meeting last year, and I agree. Yes, sharing documents is so much better than photocopying, but it’s still a boring black and white, linear, word-based thing. By focusing on these, we are ignoring the possibilities available with connected, independent students. It is important that students can access and show their previous learning, and not just for exam revision. I really like the idea of portfolios, of showing and sharing your learning, of having pride in what you produce. How many students would willingly show off their exercise book, or their Google Drive (even if it is colour-coded)? That’s why I blog, so I can show and share what I do. So my conclusion is for my Year 10 students to create individual Google Sites. These will be a combination of blog pages showing development of writing and reading skills, web pages for other topics, hyperlinks to Google Drive folders, video, widgets, and of course, comments and feedback. I’m really excited by the possibilities for students to be able to present a living document of their learning, to include evidence of everything they do, to revisit prior learning, to share their learning with a wider community and to work collaboratively. I’ve created a video to show the students how I want the sites configured to begin with, and then the journey can begin! It’s that tricky time of year when everything’s winding down, we’re all tired, but classes still go on. To keep my Year 10s interested, we’re working on a project to design a classroom environment suitable for a Year 10 English class and following a modified Design Thinking process. 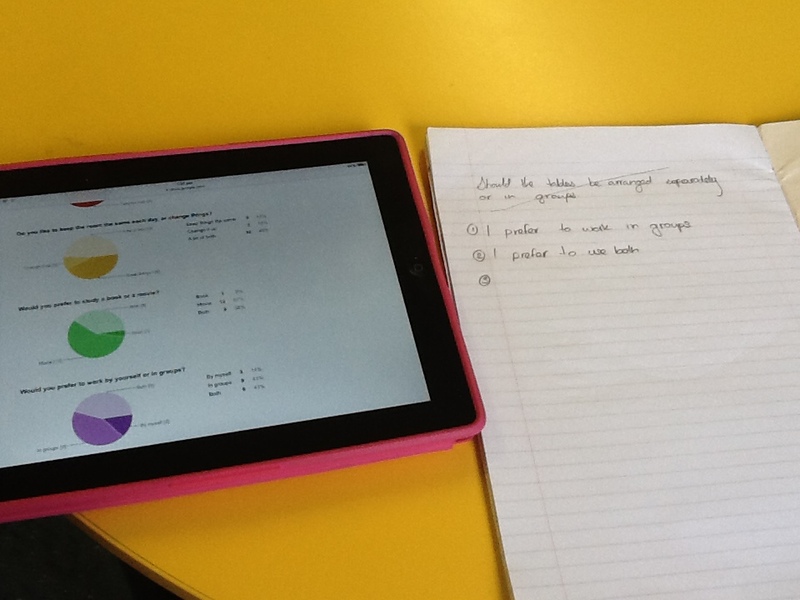 We designed a survey and sent it to another Year 10 class via Google Forms. I shared the results of the survey in graph form, and asked them to write “I” statements about each graph. What does the average student (the majority of each graph) want in their classroom? This generated complaints of “Miss, this isn’t Maths!”, but they came up with accurate statements. This was the least successful part of the process. This particular group of students struggle with generating creative ideas. They rely heavily on prompts, so all of their brainstorms ended up looking the same (like mine!). I showed them some videos of MLEs. However, they got sidetracked by the fact that most of them were of primary classrooms and therefore of no relevance to them at high school. The big leap of faith. I had had a brief play with tinkercad, and struggled. I am not spatially gifted; in fact I’m barely spatially competent. But who says the teacher has to know everything? I had faith that the students would be able to figure it out themselves, or have prior knowledge, or help each other. Fortunately, it turned out the Teacher Aide’s father was an architect and had some experience in CAD, so he was a great help. Ten minutes into the lesson I congratulated the class, and told them how different they were to teachers (some of the ones I work with at least). Teachers would need a page of instructions, a step-by-step guide, or someone showing them how to use the programme. My class followed the instructional videos, played, figured things out, and asked for help from me or the TA or each other. Their learning conversations were some of the best they’ve had all year. They were actively involved in creating, questioning and making decisions. They supported each other and took turns. Next week – after the softball tournament and Caring for the Community – the groups are going to present their designs to another group, get feedback, and iterate (did I use that buzz-word correctly?). – the teacher doesn’t have to know everything. Especially when it comes to web-based programmes, students are generally skilled at figuring things out. Although I wouldn’t go in completely clueless! – the Design Thinking model still intrigues me, and I’m looking forward to using the process explicitly more next year. A breakfast presentation this morning (great food) from Derek. His main ideas were What is FFE? and How are we preparing students for 21st century living? I was also inspired by Silvia Rosenthal Tolisano’s blog on Sketchnoting, so I gave that a go. I had fun! She emphasised having a big-picture layout in mind from the beginning, which I didn’t have, but I really thought as I was going about what was important and where there could be connections. Being a stationery-mad teacher (aren’t we all? ), I am now off to buy a sketch book and a calligraphy pen! My Year 10 class has changed dramatically since the beginning of the year. We are now down to 11 students, and there is a much better attitude to learning and each other. Our ERO reviewer suggested that we use e-asTTle to regularly (once a term) identify student achievement, then show students their next learning steps using the rubric. I was not impressed at the time, but eventually decided to give it a go. There was much hesitation on my part about venturing down the e-asTTle writing track, having heard the horror stories. I would only do it with a small group like this, as the marking load was enormous. However, the results were very interesting, with the students’ writing curriculum levels ranging from 1P to 4B. Vocabulary and punctuation were two areas where there were weaknesses across the class, so these were my first targets. 1. I showed the students the e-asTTle rubric for vocabulary and punctuation. We unpacked what it actually meant. Then I showed each student where they currently were on the rubric. 2.Our next piece of writing was the origin story for a gaming character. We spent a lot of time looking at examples and learning vocabulary. The students had a week to create their story, and had feedback throughout the process. 3. As the students were getting close to submitting their work, I reminded them to look at the next steps for punctuation and vocabulary, and to check that they were hitting the targets. Vocabulary: one student went down, one student remained the same (the highest achieving student), the others improved by one or two points. Punctuation: three students remained the same, the others improved by one, two or three points. Apply the same process to Structure and Language. We are working on a personal reading unit, and I showed the students the different language, ideas and organisation needed for a book summary and a personal response. I also spent more time putting the rubric in student language. The students are creating a website to record their reading, and they need to include both a plot summary and a personal response. I wrote this post some time ago, and it’s interesting to see what has changed in the last month. The personal reading unit was less successful in shifting student writing. Was it because the students were less engaged in the content, despite them being able to choose their own focus for reading (sports, teenage girls who become music stars …)? The students generally were able to improve their grades in Structure and Language, but overall the quality of the writing was not good. When considering the bigger picture, the original focus of my inquiry was using e-learning tools to improve student writing. Where’s the e-learning? The writing is still very much Substitution (on the SAMR model) with a little bit of Augmentation. My own thinking has developed to encompass “21st Century Skills”: collaborate, create, share. The writing becomes part of the process rather than the focus. I guess that’s what the inquiry cycle is all about, using data and research to shift teaching and learning practice. If I punctuated, I’d be even more dangerous. The joys of a shared vision! Another holiday, another conference, this time with 70 Specialist Classroom Teachers from around New Zealand. The first person I spent a decent length of time talking to was the PPTA rep, as we were the only two interested in watching the NRL Grand Final! He was very interested in my thoughts on the IES, and the possible role of the SCT. Luckily, I knew something about this initiative, and was able to have an intelligent conversation. After a hunt for coffee (thank goodness for Wild Bean – I sound like an advert for The Block! ), and the keynote, it was into the first workshop. I’d opted for a session on Literacy and Numeracy, but there wasn’t a lot of new information. One interesting revelation was that assessing students’ literacy needs was actually “on top” for me, in a cross-curricular way rather than entry testing. I was also intrigued by the anecdote of a commerce department analysing their classroom delivery and making a connection between the way they spoke in short,sharp sentences, and the students’ inability to write long, developed answers! The afternoon session had been the subject of much nervous discussion in introductions: Speed Dating. We’d be asked to bring material for a 15 minute presentation to a small group, showing our practice. I’d produced an infographic about our Professional Learning Groups, but wasn’t feeling confident. Imagine 70ish teachers, all with individual highlighted, colour-coded and numbered sheets, buzzers every 15 minutes, moving tables for 90 minutes. And it worked! Fabulously! I got some great ideas and even laminated resources! Wonderful conversations and insights. I think the others were intrigued by our PLGs, especially that there was no other appraisal mechanism. The focus of this day was a 4 hour workshop on What Shifts Teacher Learning? It was an academic, well-researched presentation, and I found it an intellectual challenge (in a good way). My key learning was that existing knowledge has the greatest impact on learning for adults. New learning must link to prior learning. This made me stop and think. At the beginning of the year, I’d really pushed Know your Learners to the staff, but I hadn’t got to Know My Learners (the staff). It explains why there can be so much negativity on occasion in Professional Learning, because the connection isn’t made to prior learning and the relevance isn’t clear. I also enjoyed the discussion about What is Learning? and will take that back to my PLG. The morning session was devoted to presentations and discussions about the IES initiative (Investing in Educational Success). $350 million invested in creating communities of schools with shared goals to support the learners’ journeys, and providing the resourcing to share ideas within and between schools in these communities. The main discussion point was the SCT’s role in these communities, as the funding and job descriptions create some dissonance between established roles and new roles. It does open up a new career path, although the temporary nature of some of the roles (up to four years) is concerning for me. Kaizena has changed my marking habits in the best way possible. I hate marking, and do everything I can to avoid it. I always feel like I can’t write what I want to say, and are the students ever going to read it anyway? A year ago, I was inspired, and over-awed by Hannah Tyreman’s blog post on fabulous feedback. While I wouldn’t want to go to that extreme, it did make me think about why I persisted with giving feedback the way I always had, when there was no evidence to say it was working. I googled voice feedback and found Kaizena. – I’m leaving better feedback. Much more targeted. Much longer and more detailed. – I’m leaving feedback throughout the essay where needed, not where there’s space to write (usually at the end). – I’m commenting on good and not so good. – For some Year 13 essays, I’m leaving up to 15 minutes worth of feedback. When do you get the chance to have a 15 minute conversation with a student? – In a couple of cases with particularly shy or self-contained students, the voice feedback is the longest conversation I’ve had with the student all year. Most of the students love it. A couple have said it’s too freaky, which is fine. Comments from those that did like it include “it feels like you’re right there with me” and “I know exactly what I have to do now”. On Monday, the principal said a parent had told him how much her son loved the feedback (I get the feeling the whole family sat round and listened to me!). Love it when compliments come from the top! I’ve also run a workshop and sent out an email tip to teachers, and it sounds like it’s being trialled in different departments. Instructions for using Kaizena are here.